Since about six month I owned a Smartthings (ST) smart home hub from Samsung and have been pretty pleased with the functionality and openness of the platform. My home is equipped with wireless light switches that can be control from ST. So I started to add motion sensors to turn on and off lights in the basement and restrooms. My choice fell on the 2nd generation Iris Motion sensor from Loewe’s. They are battery powered and so far have been reliable with the battery still at 76% after almost 6 months of service. I quickly realized that the ST system was really flexible and open. Therefore it should not be too difficult to add custom-built sensors and actors to the ST hub. This post describes the first phase of trying to build my own wireless sensors and actors. The ST hub hardware supports the following protocols to interact with sensors and actors. 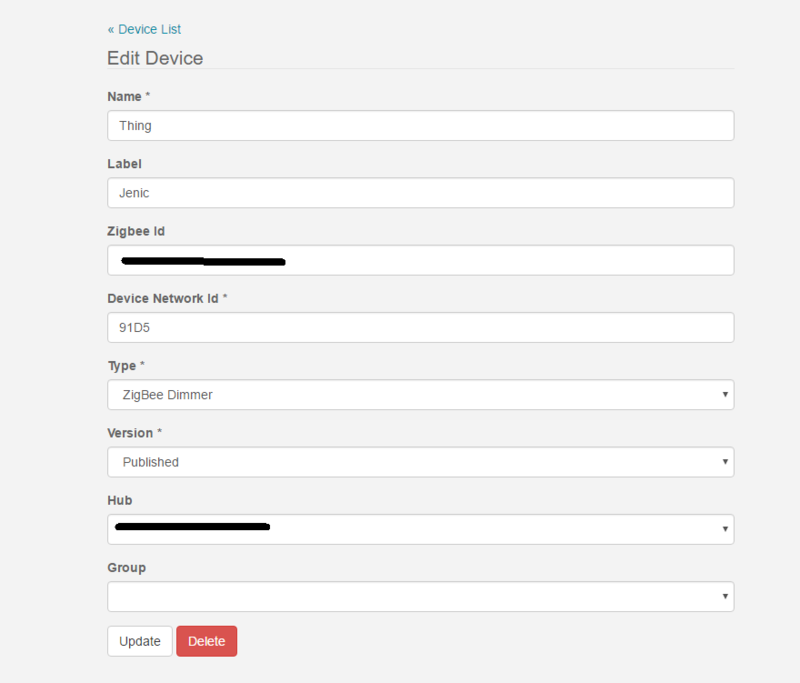 Among them TCP/IP (Ethernet, WiFi), Z-Wave, Zigbee, Bluetooth (not activated yet in ST hub). As I wanted my sensors to be battery powered, WiFi solutions like the Particle Photon or ESP8266 fell by the wayside. Therefore my focus turned to Z-Wave and Zigbee. Z-Wave is a proprietary standard owned by Sigma Designs, Inc and uses different frequency bands in different geographic regions which leads to the available z-wave modules to be rather expensive. That said there is an interesting DIY board the Z-Uno but it is not yet available in the US Freq. Band and again fairly pricey. Zigbee is the other candidate. This is an open standard that is supported by many semiconductor device manufacturers and there is a large selection of modules out there. What I was looking for are solutions that allowed to write small programs to control or sense a few IO pins. Many available modules use TI’s CC2x30 chips. These chips come with a built-in 8051 8 bit CPU. However, TI suggests using the IAR compiler and SDK. Unfortunately, it carries a price tag of ~$3000 which is hard to justify for a DIY project. 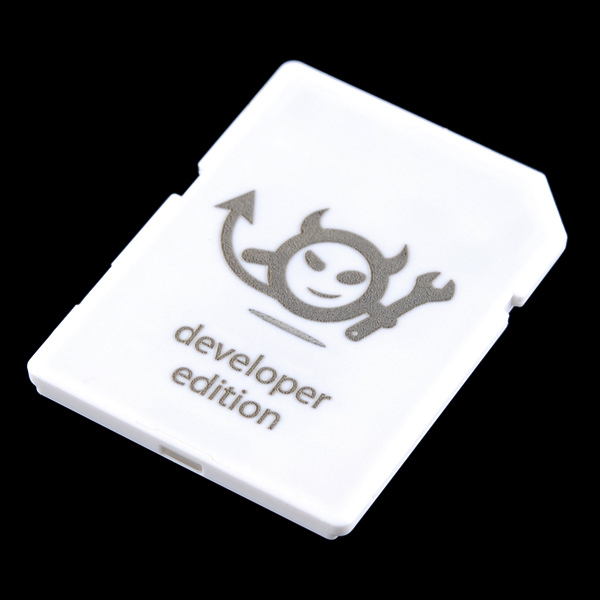 However, there is a Zigbee device that fits my needs pretty nicely and comes with a free SDK. It is the JN5168 from Jennic that is now owned by NXP and soon by Qualcomm. I settled on a MeshBee (~$20) module from Seeedstudio together with a UartSBee V4 but I expect you can also use the SparkFun XBee Explorer Dongle or similar FTDI adapters. Head over to the NXP IEEE802.15.4 Page. You must register and login first before you can download the BeyondStudio for NXP toolchain (JN-SW-4141). Then add the JN516x IEEE 802.15.4 SDK (JN-SW-4163) to your installation by following the NXP installation instructions. I also installed the Flash Programmer (JN-SW-4107) . The compile takes quite long but once finished you should have a binary “DimmableLight_JN5168_DR1175_LED_EXP_MONO.bin”. Plug your Meshbee on top of the UartSbee. Make sure SW3 of the UartSBee is in the “Prog” position and connect UartSBee with a USB cable to your computer. 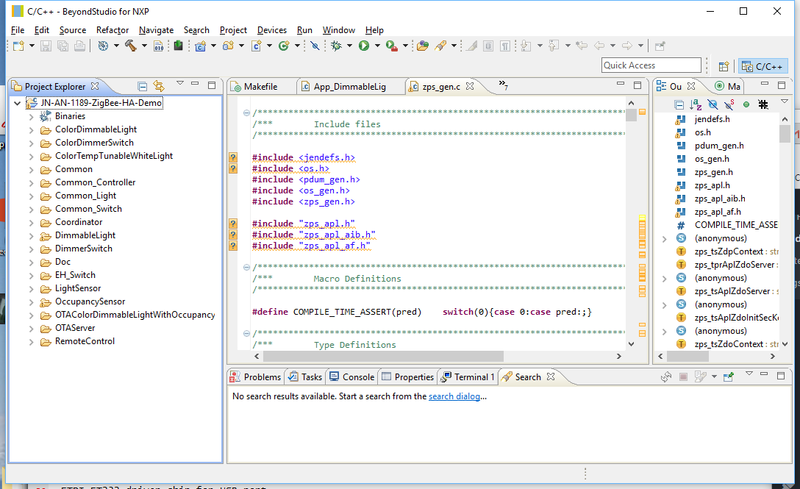 In Eclipse select from the “Device” -> “Program Device”. Program you MeshBee with the freshly compiled firmware. You can now use your ST app on your phone to add a new device. After a while, the MeshBee should show up as a “Thing” device. Rename it to something of your choosing and save it. You should now get a proper Tile in your ST App on your phone. Click on the On/Off button and in the log you should see events being logged. Connect a LED or Voltmeter to D13 and you can see the LED turn on and off. 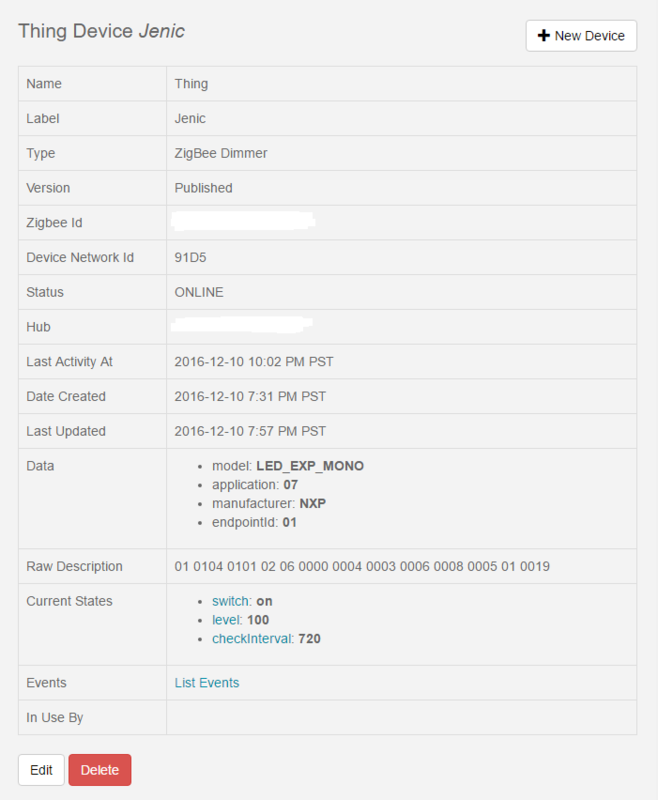 This blinky example is the “Hello World” demonstration of a Zigbee actor connected to a Smartthings hub. This is a re-post of an article I wrote as a guest blogger for Temboo’s blog. I am working with connected devices and was looking for a cloud service. While surveying the field Temboo caught my eye because of the large number of supported premium web sites and the promise to connect IoT devices to the Internet in a breeze. 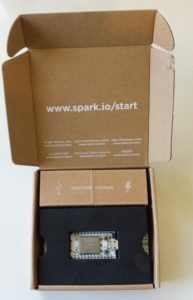 The connected device I am using is a Spark Core. 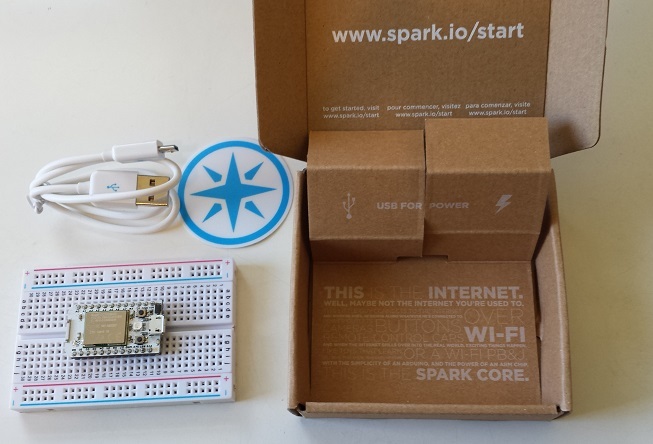 The Spark Core is a sleek small board that offers a powerful 32 bit ARM CPU paired with WiFi. The product grew out of a Kickstarter campaign and is rapidly gaining in popularity. The Spark is nicely priced and everything is open source. The team supporting the Spark Core is smart and supportive and made a great choice to port most of the main Arduino APIs to their platform. As outline in a blog post here migrating Arduino Libraries to the Spark Core often turns out to be pretty easy. With Temboo providing an open source library for Arduino I was tempted to give it a try. However, I had no Temboo-Arduino setup so I was not sure how hard it would be to get it all up and running. Well, I am happy to report that is was easier than expected. Temboo’s code is well written. I only had to work around some AVR specific optimizations that Temboo did to save program memory. As the Spark Core is built around a STM32F103 chip resources are not as tight as with the AVR so I simply bypassed these optimizations. to the source code. Temboo support for the Spark Core is a lot of fun. It is easy to setup your own Temboo account and compile the Temboo Arduino Library that now supports the Spark Core platform. To learn more about similar projects please visit my blog at http://bentuino.com. 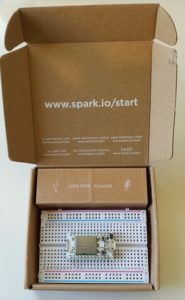 In a previous blog post I was describing an example of how a Spark Core can be used to read weather sensors. The setup was really no different from any simple Arduino Uno setup. It only demonstrated how easy it is to port Arduino Sketches to a Spark Core. With the integrated WLAN I was interested to connect the Spark Core to the internet cloud. One of the simplest ways I found, was using Google’s Spreadsheet service. I stumbled over this idea in this Spark forum post. It publishes a variable for cloud access and then increments it in regular intervals. Together with the following Google script I was able to quickly pull data from my core. However when I setup a time trigger to run the script in regular intervals I found the setup to be very unreliable. This is discussed and documented by several Spark Users and as of this writing I have not seen a fix for this problem. One thing to note is, that this approach is pulling data from the Spark Core rather than the core pushing them to the cloud. This has a significant flaw as we cannot put the core into standby between the measurement intervals. Therefore this solution is anyway not a good choice for low power applications. So stay tuned, I am experimenting with a better solution that I will blog about in my next post. 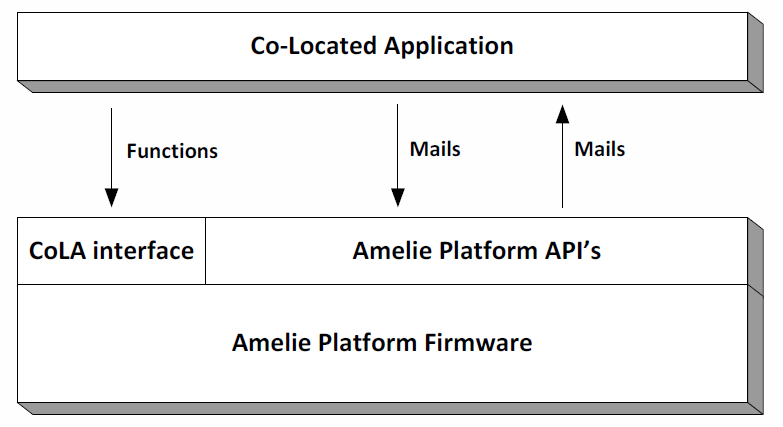 I have tested several IoT platforms over the last couple of weeks. So I was not too keen to checkout yet another one. However, when I got the annoucement that the Spark Core is shipping I could not resist and ordered one. It arrive in the mail today so I thought I will take it for a spin. 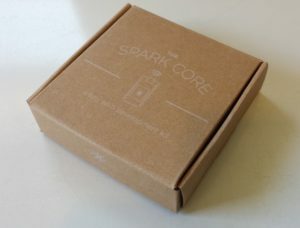 The Spark Core comes in a very stylish little box. 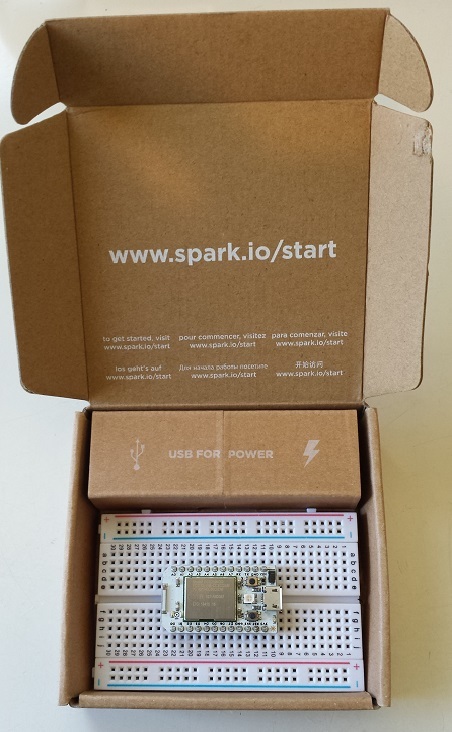 Overall, the box contains the Spark Core board, a breadboard, a micro-USB cable and Spark sticker. If everything works well you will get rewarded with the RGB-LED on the Spark board flashing in rainbow colors. Once the Spark Core is connected to you WiFi and paired with the Spark cloud, it took me only a few minutes to get an on-board blue LED blinking. All the Spark Core software is open source. The board uses a CC3000 WiFi Module from TI combined with a 32-bit ARM Cortex-M3 powered STM32F103 from ST Microelectronics. The Spark team has come up with a nice integration of this hardware and the cloud server back end. It is based on the CoAP protocol specification and allows for an easy and energy efficient integrated IoT solution. The cloud API offers over-the-air (OTA) firmware updating where the input can either be c/c++ source code or binaries. For those that don’t want to use Spark Builder, their cloud based IDE the web site also promises support for desktop IDEs like Eclipse. So much for today, I will cover more details in future blogs. Do you need WiFi Connectivity in your project? There are a lot of WiFi solutions for Makers out there. However many are either expensive, big or outdated. So it is refreshing to look at the technical data of the little known WiFi module available by the name of RTX4100 from RTX Telecom. You may never have heard of RTX Telecom but this Danish design service company specialized in wireless has been around for many years. 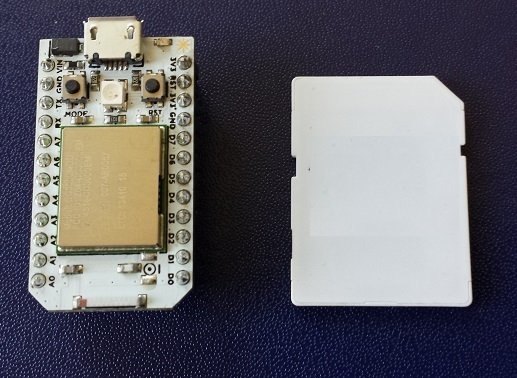 The module is hardly bigger than a Bluetooth module. 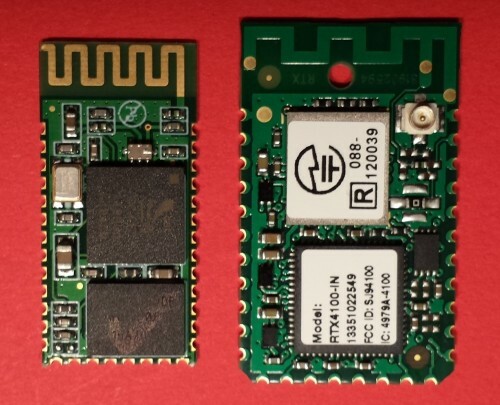 Figure1: on the left a simple Bluetooth HC-5 module and on the right the RTX4100 WiFi Module. The RTX41xx uses latest WiFi System in a Package (SiP) technology. It features a Nordic Semiconductors 32-bit ARM Cortex-M3 based low power microcontroller. The WiFi is based on a AR41xx SiP from one of the leading WiFi chip manufacturer Qualcomm – Atheros. The 32-bit application processor is responsible for all the WiFi driver related duties. But an API allows to program custom application into the module. RTX calls the custom programs Co-Located Application or CoLA. Besides the RTX4100 that offers 24 kBytes flash memory and 3 kBytes RAM for custom applications. RTX also offers a pin compatible RTX4140 that provides much more programmable memory for CoLA applications, 512 kBytes flash and 64 kBytes RAM. The SDK can be downloaded from RTX’s web site together with a comprehensive set of documents and CoLA examples. RTX has also teamed up with some cloud services. The currently supported cloud partners are: 2lemetry, Exosite, Nabto and Sensinode. For simple applications like WiFi sensors or actors that require a limited set of IOs and CPU/Memory resources RTX41xx modules can be used stand alone. They are also a great choice for embedded projects based on Arduino that need WiFi. Similar to some of the popular Bluetooth modules you only need a spare UART or SPI interface to talk to the RTX4100. Unlike Electric Imp that offers you a fully integrated platform form the module all the way up to the cloud, RTX is a much more open and flexible platform where you retain control. However this control also comes at the price that you have to do more software work. The good news is that you don’t have to start from scratch, RTX supports you with quite a bit of Software. Yesterday evening Hugo Fiennes, CEO and Co-founder of Electric Imp gave a talk at the Mountain View Hacker Dojo. Hugo did a great job explaining the Electric Imp platform to a packed room. Besides a M&M candy dispenser that he controlled over the internet he also brought a board with the next generation Electric Imp on it. The Electric Imp is the silver module on the left. The tiny size gives an idea of how small of a form factor internet connectivity will be available. Hugo also shared his excitement about the reduction in power consumption and the ability to power IoT devices from batteries. 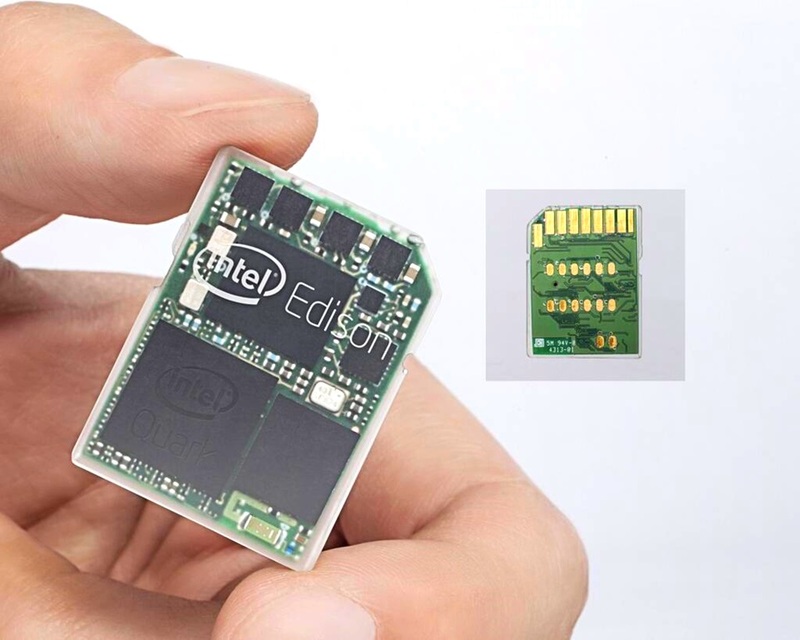 At the CES 2014 Intel announced the Edison platform that is intended to enable IoT applications. As pointed out in my earlier blog, there is a pretty similar solution out there. It goes by the name of Electric Imp. Such an impressive combination promised some fun, so I was curious how well all the components would work together. To try it out I got myself an Electric Imp and the related Imp Arduino Shield from Sparkun. In order to use it with Arduino Shields or Arduino Boards you have to also order the headers and solder them on the board. I use the Arduino Stackable Header Kit . The stackable header allow you to use the Imp as a “WiFi Shield” to an Arduino Single Board Computer (SBC) as well as being a standalone SBC. If you only use you Electric Imp as a SBC you won’t need any stackable headers. Also make sure you order the headers that fits your Arduino board. There are different revisions out there. The R3 version has additional pins and will not fit an original Arduino board. Once the headers are soldered down you can plug the Electric Imp Shield on top of an Arduino board. Signup for an account on http://electricimp.com and download the BlinkUp app to your smartphone. 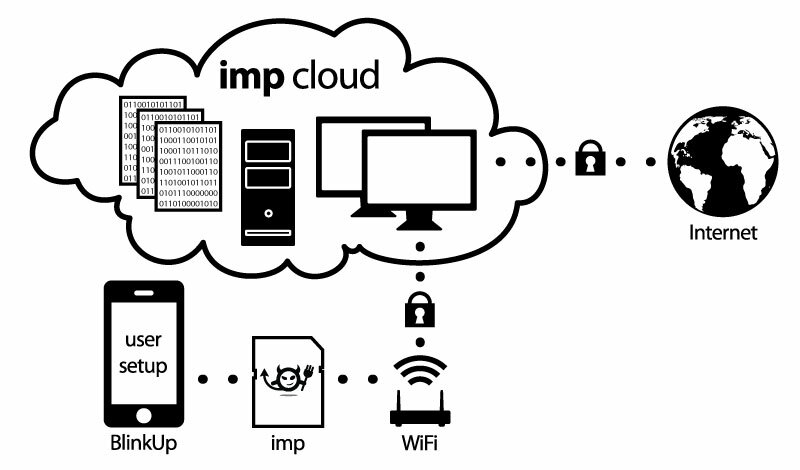 Fire-up the app and log into your Electric Imp account with your credentials. It’s time to power up the Arduino-Imp combo. Hold your Phone screen flush with the front edge of the Electric Imp card and start the pairing process. The phone screen flashes for a while. Once the flashing stops the Electric Imps status light should turn green. You can get detail instructions on the Electric Imp web site or on Sparkfun. So far not a lot of challenges. Time has come to whip together some code that brings this combo to life. To test the Electric Imp I used some modify code from their web site. // schedule imp to sleep for .5 seconds. // schedule imp to wakeup in .5 seconds and do it again. The code above let’s the two LEDs on the Electric Imp Shield blink alternatively for half a second each. So if you see the LEDs blinking, you know that the IDE properly compiled it and downloaded it over the internet into the Electric Imp card where it gets properly executed. Well Done! Stay tuned, in my next installment I will try to get the Electric Imp talk to the Arduino. Last summer at the Maker Fair in Rome Intel announced the Galileo single board computer . This week at CES 2014 in Las Vegas Intel followed up with another initiative that carries an inventors name. This time it is Edison. The Edison board is more advanced take on the Quark System on a Chip (SoC) based single board. The board is only the size of an industry standard SD card. So don’t expect to solder it yourself. However the card is a full featured single board computer that will offer support for multiple operating systems (OS). The integrated WiFi will turn any device equipped with an Edison into an IoT solution. Intel also promised to release design files that will make it easy to integrate Edison into your own project. Among the tool vendors that will support Edison is Autodesk. The company just announced the acquisition of circuit.io. This online PCB design tool is now a part of Autodesk’s 123D design suite. For those that cannot wait and want something today the Electric Imp Wireless SD-CARD is an interesting alternative. This card is clearly not as powerful as an Edison. However given the creativity that innovators have displayed around the meager Arduino 8-bit AVR CPU it may still be plenty.